THPBlog: Sierra Pacific Industries to log out nice high elevation stands near Donner Lake. Sierra Pacific Industries to log out nice high elevation stands near Donner Lake. 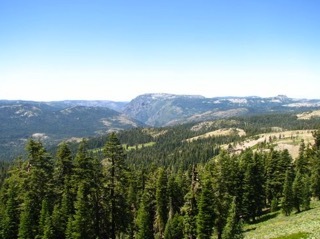 This THP is 4 miles SW of Truckee, CA and 1.5 miles south of Donner Lake and Interstate 80 near the Sierra crest at an elevation of 6,200 to 8,020 feet. Sierra Pacific Industries is planning a tractor based logging operation on steep and unstable slopes amongst nice high elevation stands of Jeffrey pine, western white pine, red fir, white fir, western hemlock and lodge pole pine. The THP area is close to the Pacific Crest Trail in section 34, and drains towards the Truckee River which is listed as an impaired watershed for siltation. There are 3 granitic/sandy slide areas in sections 35 and 26, including over steep headwall scarps and loose hummocky terrain. 52 road drainage sites are planned for work including rocking, dip construction, ditch cleaning, culvert repair/replacement and restoration of washed out crossings. Donnor pass buckwheat was reported within 3,600 feet of the THP area. More information is available on the THP Tracking Center website.